The temptation to compare Brad Mehldau to Keith Jarrett can be irresistible. For better or worse, usually better. Both seemed to materialize fully formed, highly praised, with their first recordings. And unlike some who have been lauded early and then forgotten (or at least, ignored), both Jarrett and Mehldau maintained and surpassed their first successes with each new release, each new project. Both pianists are acclaimed as much for their skills as composers as performers, as soloists as well as trio leaders. And both show amazing longevity—prolific in recordings, consistent in their bandmates, although of course Jarrett has maybe two additional generations of work behind him. And there are striking similarities in their approach to composition and improvisation—brilliant development of voicings, an uncanny ability to slide from delicate balladry to rollicking blues in the blink of an ear, and a not-infrequent tendency to fall into ruminative constructions that can be either tedious or serene. Jarrett has recorded classical works, while Mehldau has recorded duets with classical vocalists. Mehldau just released a double CD of solo performances, Live in Marciac, and undoubtedly there will be critical comparsions to Jarrett’s famed live solo recordings. Thankfully, Mehldau does not engage in audible counterpoint, a Jarrett trademark. He also seems more at ease with an audience—he doesn’t allow photography but he does take the mic and introduce tunes and cohorts. As a composer, he’s also branched out into orchestration with his recent Highway Rider project. Best of all, Mehldau performs in jazz clubs, where there is always a risk of clinking glasses and silverware, a chatty table, a passing waitron. But Mehldau is thus accessible to a broader audience and, usually, so is his music. And particularly so last night at the Dakota, with an opening set that relied more on the established jazz canon than on wholly original material. Not that Mehldau gives any composition “established” treatment, as his reinventions always bring forth new ideas, creating a new songbook with each performance. His most introspective moments –though short-lived--came on the first tune, a reconsideration of Jimmy Hendrix’s “Hey Joe.” A soft balladic introduction morphed into a swinging blues, Mehldau gradually extending his voicings and intervals, opening wide spaces for drummer Jeff Ballard to fill with thumpy delight. The trio’s renditions of Jobim’s “How Insensitive” and Newell Chase’s less familiar “My Ideal” confirm opinions that this ensemble is among the best of modern balladeers. Jobim was translated with a delicate touch on keys, sturdy but supportive basslines, and a wide range of percussive effects as Ballard switched seamlessly among brushes and sticks, skins and rims. 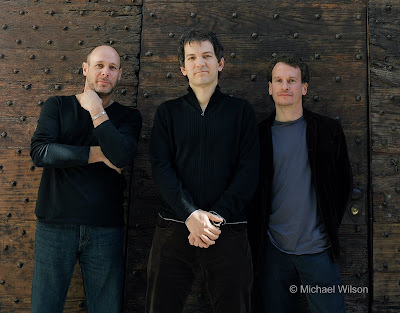 Mehldau added layers of harmony as he moved along, the Brazilian tint graduating to a more American blues feel, trading the melodic lead from right hand to left. “My Ideal” is a gorgeous tune that should be covered more often. With bassist Larry Grenadier hanging a bit behind the beat, Mehldau was simply enchanting, moving elegant voicings (particularly in the left hand) to a rhapsodic closing verse with an extended solo followed by Grenadier’s arco bass and Ballard’s almost brooding mallets that glided into the next tune—probably a Mehldau original with hints of Highway Rider. Mehldau’s chime-like sequences were supported by Ballard’s soft-hitting mallets and Grenadier’s alternating fluttery and percussive strokes, ultimately evolving into a more adventurous journey, Mehldau forging ahead with a chunky vamp in his right hand. Prolonged applause earned an encore, the most up-tempo piece of the set, John Coltrane’s “Countdown.” Ballard’s solo took him through the full drumkit and every bit of his dynamic range, Mehldau’s shifting rhythms and harmonies suggesting more Cecil Taylor than Keith Jarrett. Comparisons to Jarrett have not diminished Brad Mehldau. And comparisons to Mehldau won’t diminish the new generation of jazz pianists now finding their own way.